(1) Maintaining a moist environment. The importance of a moist environment was identified by the work of George Winter (1962). His research has had a profound effect on wound management. He compared the effect of leaving superficial wounds exposed to form a scab with the effect of applying a vapour permeable film dressing, using an animal model. Epithelialisation was twice as fast in those wounds covered with a film dressing. This was because the dressing maintains humidity on the wound surface. Thus, the epithelial cells were able to slide across the surface of the wound; whereas in the exposed wounds the epithelial cells had to burrow beneath the scab, beneath the dried exudate and beneath the dessicated layers of cells to find a moist layer to allow movement across the wound. Later studies have confirmed this finding and identified other benefits as well. 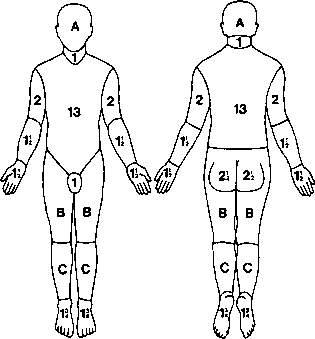 May (1984), Eaglstein, (1985) and Alvarez and Dellanoy (1987) all found local wound pain was considerably reduced in a moist environment, possibly because the nerve endings did not dry out. Studies by Freidman and Su (1983), and Kaufman and Hirshowitz (1983), showed that the moist environment enhanced natural autolytic processes, breaking down necrotic tissue. All dressings should have some degree of antibacterial properties. Some will have constituents which are bactericidal and others provide a barrier between the wound and the environment. The benefits of the dressing as a barrier are two-fold. It prevents contamination of the wound by stopping airborne micro-organisms penetrating through to the wound. Also, bacteria on the wound surface are prevented from escaping into the environment and causing cross infection. However, a soaked or leaking dressing provides a pathway for bacteria in both directions. Although the wound surface should remain moist, excessive moisture causes maceration of the surrounding skin. The precise balance that needs to be maintained by the dressing between moisture and absorbency is still not certain. (5) Does not require frequent dressing change. A major advantage of many of the modern products is that they are very simple and quick to apply. Realistically, this has helped to promote their use with the nurses who regularly provide wound care. A dressing which conforms well to the shape of the wound is likely to assist in maintaining a moist environment and also provide an effective barrier for bacteria. If a dressing is easy to remove it is less likely to damage any of the newly formed tissue in the wound; it is also less likely to be painful for the patient. Another advantage of many modern products is that they are comfortable for the patient when they are in situ. This means that the patient is more likely to want to comply with the treatment regime. In any case, there is no need for patients to suffer unnecessary pain or discomfort. The majority of modern products can be left in place for several days, depending on the wound and, particularly, the amount of exudate. This not only saves nursing time and reduces costs but also reduces the amount of interference with the wound. Reduction in the frequency of dressing change helps to reduce the opportunities for a drop in temperature on the wound surface. This can potentially occur at each dressing change. Myers (1982) studied 420 patients and found that, after wound cleansing, it was 40 minutes before the wound regained its original temperature. Furthermore, he found that it took three hours for mitotic activity to return to its normal rate. Patients also find less frequent dressing changes beneficial. Some patients find dressing change an ordeal and others, especially community patients, an inconvenience which disrupts their life.